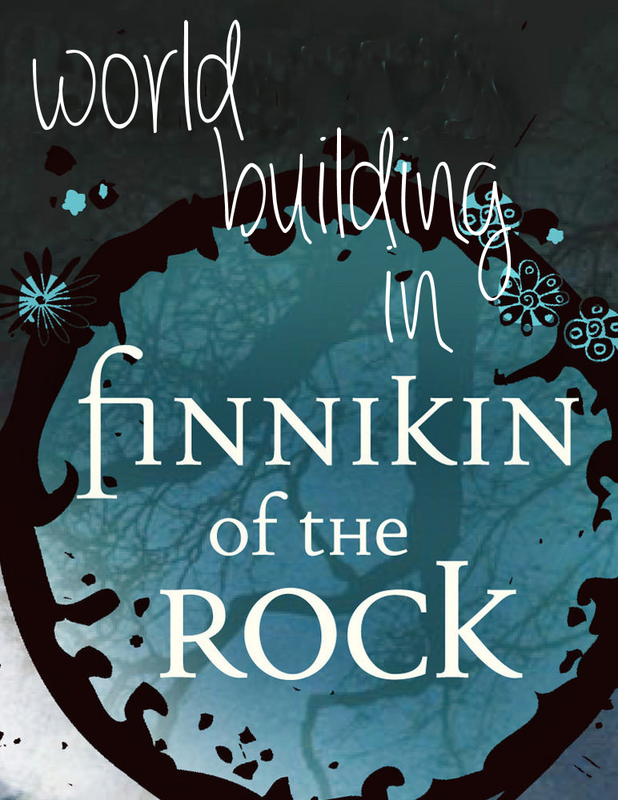 Today, as part of Paola and Charlene‘s celebration of Melina Marchetta’s The Lumatere Chronicles, I’ll be writing about world building in the first book, Finnikin of the Rock. I also recently reviewed the first book in the series. I thought I would choose world building as my topic as I’m a big fan of many different fantasy series, each with their own worlds, cultures, peoples and religions. I’ve read about so many different kinds of fantasy lands, and believe that a big part of a successful fantasy novel is pulling off the world building. The author needs to create completely new concepts, yet still make them believable to the reader, and come up with new names that don’t sound ridiculous, yet sound different enough. Skuldenore is the land in which The Lumatere Chronicles take place, split into eight different countries: Sorel, Charyn, Osteria, Sarnak, Sendecane, Belegonia, Yutland and Lumatere. Marchetta only really talks about a couple of the countries in Finnikin, and these are the impressions I got of them. Yutland: a savage country, full of barbaric peoples, with a rather guttural language. Belegonia: a cultured and much more civilised country, the capital has a very cosmopolitan air to it and the people seem to be highly educated. Osteria: contains a mix of peoples – perhaps a common destination for refugees from Lumatere? Charyn: a dry and rocky country to the east of Skuldenore. 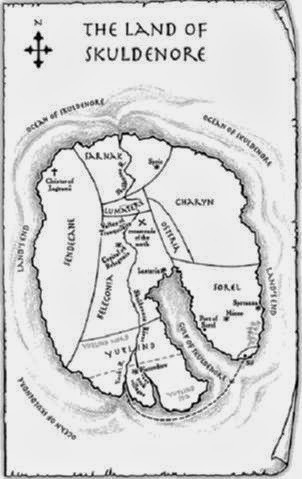 Sarnak: a land to the north of Skuldenore, very poor – this is where Finnikin and Evanjalin find Froi. Sorel: a very rough place, where the prison mine is located. And of course, Lumatere. Lost to its people a decade or so before the beginning of Finnikin of the Rock. The royal family are murdered, people attacked, the kingdom ruined. A curse is placed on Lumatere, trapping the people within who did not escape in time, and no-one knows what has actually happened to them. So the remaining people of Lumatere become refugees and exiles, spread out amongst the countries of Skuldenore. They are second-class citizens elsewhere, forbidden from speaking their native tongue and struggling on with life. Considering that Lumatere accepted people from all over, with no problems, it must have come as a shock to the Lumaterans. Located in the centre of Skuldenore, its people vary in appearance apart from one feature – deep set eyes. The people are divided into five types, depending on where they are from within Lumatere: the mountains, river, flatlands, rocks or forest. Certain traits are also typically associated with people from the different areas, such as stubbornness. It is governed by a king or queen, and the large majority of the book is spent hunting for Balthazar, the rightful heir to the throne and believed to still be alive. From the description of Lumatere in its hey-day, it sounds idyllic and seems to represent the ‘perfect’ kingdom: accepting of all, beautiful landscapes, bountiful harvests, a fair and good ruler, happy citizens. There wasn’t a great emphasis on religion, but there is mention of two goddesses – Sagrami and Lagrami. As opposites, Sagrami appears to be a deity of darkness, worshipped by Seranonna who placed the curse upon Lumatere. Lagrami is the deity of light. The two opposite sides of the circle is a common feature in fantasy religions. It appears that the clergy of this particular religion are priests and priestesses, who live in cloisters – and that is where Finnikin and Topher find Evajalin at the beginning of the book. I did pick up one small feature of the religion – the priestesses shave off their hair on joining the cloister, and let it grow to signify their length of devotion to the goddess. Unlike Tolkien, who built up a great back story and history for Middle-earth within his books, Marchetta tends to express Lumatere’s history through exposition. I actually really enjoyed these scenes, with various characters often explaining part of the country’s history to another, or favourite stories being retold to excited youngsters. I haven’t actually often encountered this method in fantasy writing – after all, isn’t it always said that you should show and not tell? – but with Marchetta’s wonderful prose it works. As for the culture of Skuldenore, it seems to be very varied. I did feel a little like some of the countries were a bit stereotyped – for example a dry and arid land, with savages and a guttural tongues (Yutland). Each country is very different, with various political systems and potential allies. It is not just men that hold the power – female power is also represented, there are plenty of ladies and mentions of queens. So despite being a quasi-medieval system, women can wield power and authority in Skuldenore. Slavery is also present, at least in Sarnak where Finnikin and Evajalin pick up Froi – however, it was not legal in Lumatere – evident by Finnikin’s shock – further emphasising its status as a ‘perfect’ kingdom, and making its downfall even harder to bear. For a fantasy world, there are few mystical beings or creatures, and little use of magic. There is, of course, the curse which Seranonna places upon Lumatere, and the prophecy that speaks of its revival, but that is all in the past as regards to the story. Evajalin’s dream walking could be classed as magic, but there isn’t much in-depth discussion about it. However, since the ‘Unspeakable’ – the slaughter of the royal family and curse on Lumatere – it is possible that the people of Skuldenore have become very paranoid about magic. Also, I do wonder whether Marchetta had some inspiration from Shakespeare, particularly The Merchant of Venice. As children, Finnikin, Balthazar and Lucian made a pledge, sacrificing flesh to seal it. Both feature a character who may be hiding secrets, and a character called Balthazar. Marchetta manages to pull off the fantasy world very well. It can be a struggle, making places believable, and I often find with fantasy that sometimes the names can sound down right cheesy. Many of the names in the book are altered versions of real life names, to give them a more fantastical feel, and this works well. Although there are not many descriptions of landscapes, nor a massive history bear that which is relevant to the main story, for a fantasy that is more about the characters and their personal journey than the world in which they live, Skuldenore is wonderfully built. 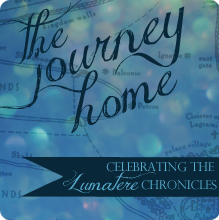 This post is part of The Journey Home, a celebration of the Lumatere Chronicles hosted by Bookish Whimsy and A Novel Idea.